God has blessed Mark and me with a close relationship. He’s strengthened and grown each of us individually and as a couple. Certainly our marriage isn’t perfect, but we truly love each other more than ever. That being said, we have room to grow, which is where Choosing Him comes in. 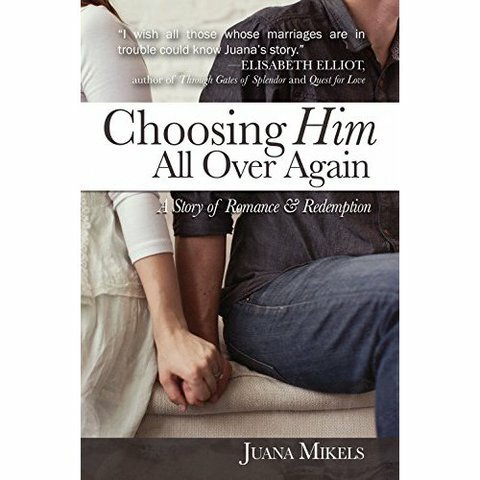 Juana’s personal experiences and biblical insights inspire me to endeavor toward becoming a more godly wife. Skillfully she weaves biblical advice for wives all through her story, and I desire to implement those tips that especially resonate with me. Every bit of truth from God’s Word that I practice in my marriage will result in blessing. I don’t know exactly what shape those blessings will assume, but I know without a doubt: God blesses obedience. Having this aspect of my life–the privilege of being a wife–presented from a biblical perspective grants me further tools to build my marriage God’s way. One particularly meaningful piece of wisdom from Choosing Him remains with me: Taking note of my husband’s preferences and doing my best to follow them. Thankfully Mark isn’t picky or demanding, but certain things still are important to him. For example, he doesn’t like me to work after he gets home, which is very hard for me. Sometimes days overflow with so much activity that ministry responsibilities and housework require attention in the evening. I don’t know exactly how to remedy this, nor do I possess a precise plan of how to restructure commitments and duties in order to please my husband more fully, yet I’m going to try. And with God’s help I’ll succeed one step at a time. As I humbly follow Christ in my role as a wife, God will lead me in triumph and permeate every place with the knowledge of Him. Wow, that’s powerful. This book is for me … and for any woman who wants to become a more godly wife. Thanks Emily, for sharing your views about the book. I like the way you put it into a life application for your home. I followed your link from Juana’s Site. God Bless you and Mark. You’re welcome, and to God be the glory! Thank you so much for visiting from Juana’s site. Blessings to you and your husband as well ~ may Christ’s love fill your hearts and home.